The KBShimmer Birthstone collection is a set of twelve birthstone inspired (duh!) metallic flake glitters with a touch of holo. They're all completely opaque by the second coat and have an intense sparkle. I used 2 coats and the KBShimmer Clearly on Top topcoat in all of my swatches. Garnet (January) is a burgundy metallic flake glitter with holographic particles. This stone is most often represented in a deep, rich burgundy red stone, though they can vary from oranges to green. Garnets also symbolize friendship and trust. Amethyst (February) is a warm purple metallic flake glitter with holographic particles. Amethyst was thought to also protect against drunkenness and provide calm, balance, patience, and peace. Aquamarine( March) is a pale blue metallic flake glitter with holographic particles. 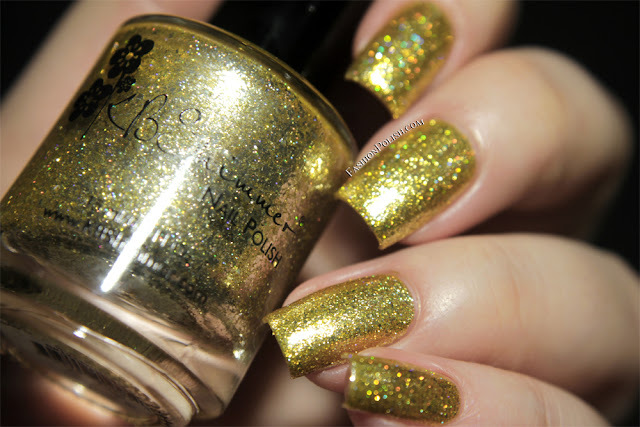 Diamond (April) is a golden yellow metallic flake glitter with holographic particles. This classic stone of love is coveted for its sparkle and is one of the hardest stones on earth. This near colorless gem also comes in fancy colors from browns and yellows, to pinks and red, but, we can’t help but love the traditional near white colorless diamond with its awe inspiring shine! Emerald (May) is a green metallic flake glitter with holographic particles. This stone encompasses a wide variety of rich green shades from pale tones to deep hues. Emerald has long been a symbol of rebirth and hope. Black Pearl (June) is a charcoal grey metallic flake glitter with hints of green and holographic particles. The Black Pearl is thought to ward off negative energy and evil spirits. 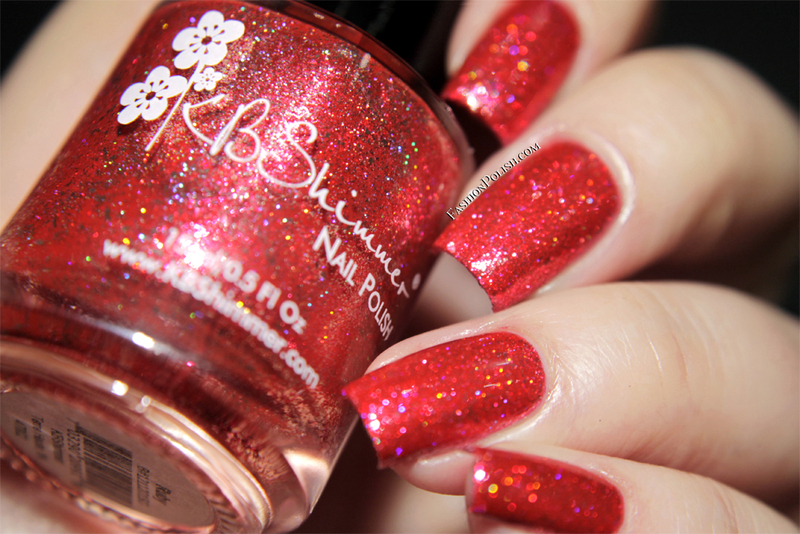 Ruby (July) is a bright red metallic flake glitter with holographic particles. Ruby is said to bestow good fortune on its owner. Peridot (August) is a pale lie green metallic flake glitter with holographic particles. Peridot is believed to instill power and influence as well as protect against nightmares. Sapphire (September) is a rich navy metallic flake glitter with holographic particles. In the Middle Ages, Sapphires were believed to protect those close to you from harm and also represented loyalty and trust. 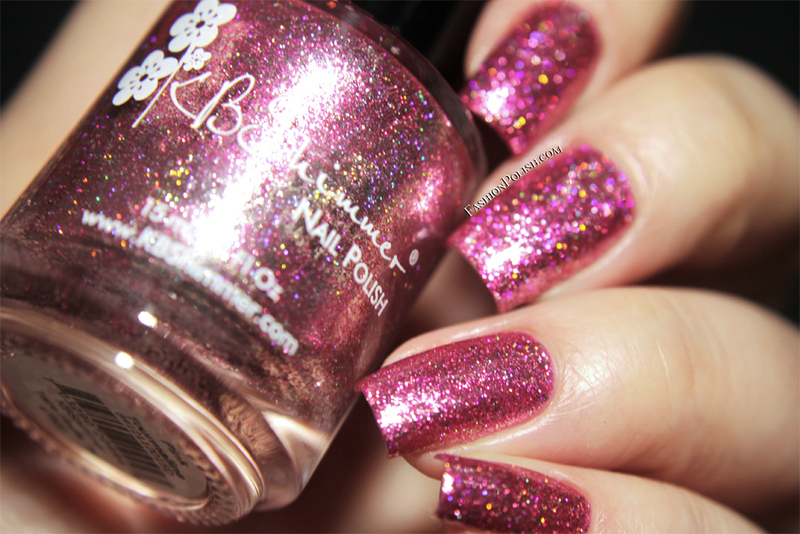 Pink Tourmaline (October) is a pink metallic flake glitter with holographic particles. Ancient legend says that tourmaline is found in all colors because it traveled along a rainbow and gathered all the the rainbow’s colors, but our favorite is the Pink Tourmaline. Citrine (November) is a golden yellow metallic flake glitter with holographic particles. The legend says the warm color of Citrine is a gift from the sun for healing. 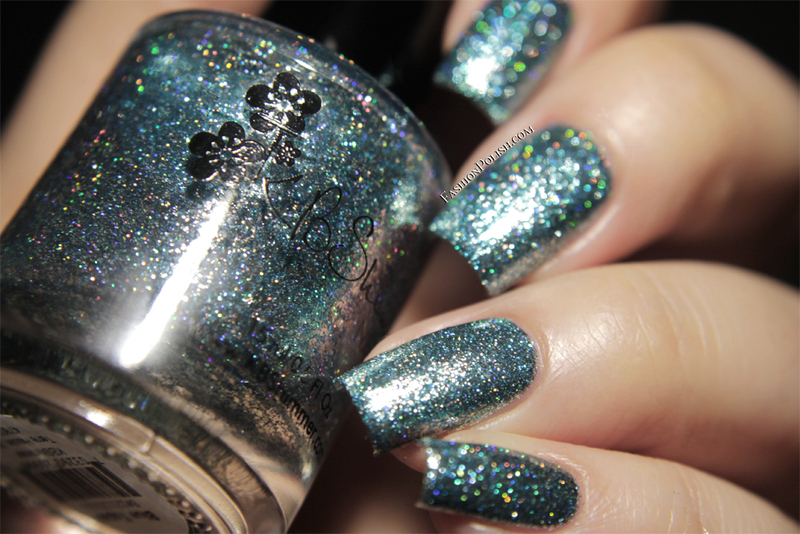 Blue Topaz (December) is an icy blue metallic flake glitter with holographic particles. The legend says Blue Topaz brings is wearer wisdom and invincibility. So here they are : Diamond, Black Pearl, Ruby, Amethyst and Sapphire! 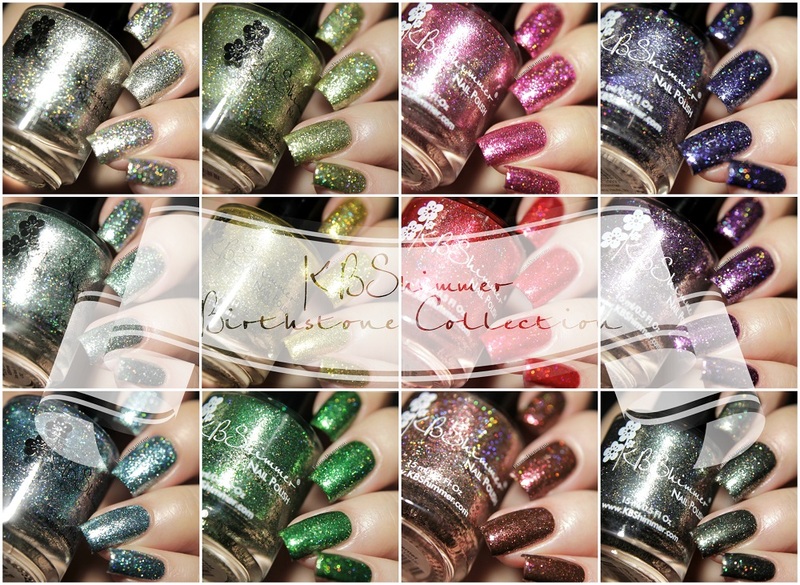 The KBShimmer Birthstone collection is already available on Harlow&Co. Individual polishes retail for $11 (Free shipping over $25 in Canada, $50 in the US and $100 internationally).